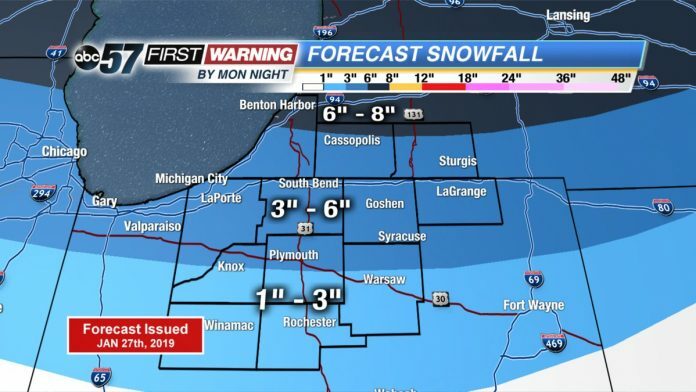 The National Weather Service of Northern Indiana has issued a Winter Storm Warning for Berrien and Cass Counties starting at 2 a.m. on Monday, Jan. 28 and lasting until 7 a.m. on Tuesday, Jan. 29. A Weather Advisory is in effect for the rest of the listening area which will start at 3 a.m. on Monday, Jan. 28 and end at 7 p.m.
Berrien and Cass Counties could see 8 to 12 inches. * WHEN...From 3 AM EST /2 AM CST/ to 7 PM EST /6 PM CST/ Monday. Moderate to heavy snow will begin during the overnight hours of Monday. The morning drive could switch to a wintry mix or even rain as temps warm above freezing south of the Indiana Toll Road. By Monday night, the system snow/mix ends as the lake effect picks back up again. Totals haven’t changed too much with the northern edge of Michiana picking up around 6+”, 3-6” for central Michiana, and 1-3” farther south thanks to the wintry mix chances. Portions of Berrien and Cass Counties could get 8-12″ by early Tuesday morning. Once the snow clear out, temperatures will drop dramatically and potentially life-threatening and record-breaking cold will set in. The coldest day in the snap is Wednesday, where Michiana’s could see a daytime high of -8 with ’30 to -40 wind chills, which could mean that the coldest all-time high temperature record could be broken this week. Monday: Cloudy with snow and a wintry mix farther south. High of 34. Tuesday: Mostly cloudy with scattered L.E. snow showers possible. Cold and breezy. Highs near 10 and slowly falling. Tuesday Night: A 30 percent chance of snow showers before 1am. Mostly cloudy, with a low around -14. Wednesday: Mostly cloudy and cold, with a high near -10. Wednesday Night: A 40 percent chance of snow showers after 1am. Mostly cloudy, with a low around -15. Thursday: A 30 percent chance of snow showers. Partly sunny and cold, with a high near 3. Thursday Night: A 40 percent chance of snow showers. Mostly cloudy, with a low around -4. Friday: A 50 percent chance of snow showers. Mostly cloudy and cold, with a high near 17. Friday Night: Mostly cloudy, with a low around 6. Saturday: Partly sunny, with a high near 28.